A mother of three has been jailed for stabbing her boyfriend in the back during a drunken argument. Claire Duncan, 33, pleaded guilty at Teesside Crown Court to unlawfully wounding her boyfriend, who had appealed to the judge for her to be set free. Judge Sean Morris said that the public would be rightly outraged if he did not send her immediately to prison, even though she had been suffering from a degree of post natal depression and she was drunk. Prosecutor Emma Atkinson said that after the stabbing at their home on July 22 last year Duncan asked him: "Are you not dead yet?" 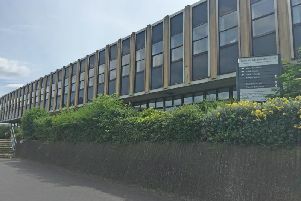 Rod Hunt, defending over a videolink from Newcastle Crown Court, urged the judge to give her a suspended prison sentence with strict requirements. He said: "She is ashamed of what she has done. "Her boyfriend spoke up for her to the officers who attended the scene, and he attended at the last court hearing and supported her." The judge told Duncan, who had previous convictions for violence: "I accept that you may have been suffering from a degree of post natal depression, but nobody could say the severity of that. "You were drunk. You have two previous convictions for assault, one some time ago on your brother in 2012 for battery, and in 2016 you headbutted an unknown female. "You were originally charged with wounding with intent. "You stabbed your own partner in the back and then you went up to him as said: "Are you not dead yet?'" The judge added: "I am afraid you can't be allowed to stab people in the back and allowed to walk out of the prison door. "The public would be righty outraged if somebody when drunk , even if they are suffering from a degree of post natal depression, plunged a knife into a man's back." Duncan, of Lincoln Crescent, Billingham, was jailed for 10 months.